-- Select a Size -- 6"-10" - Out of Stock! 10"-16" 14"-20" - Out of Stock! 18"-26" - Out of Stock! 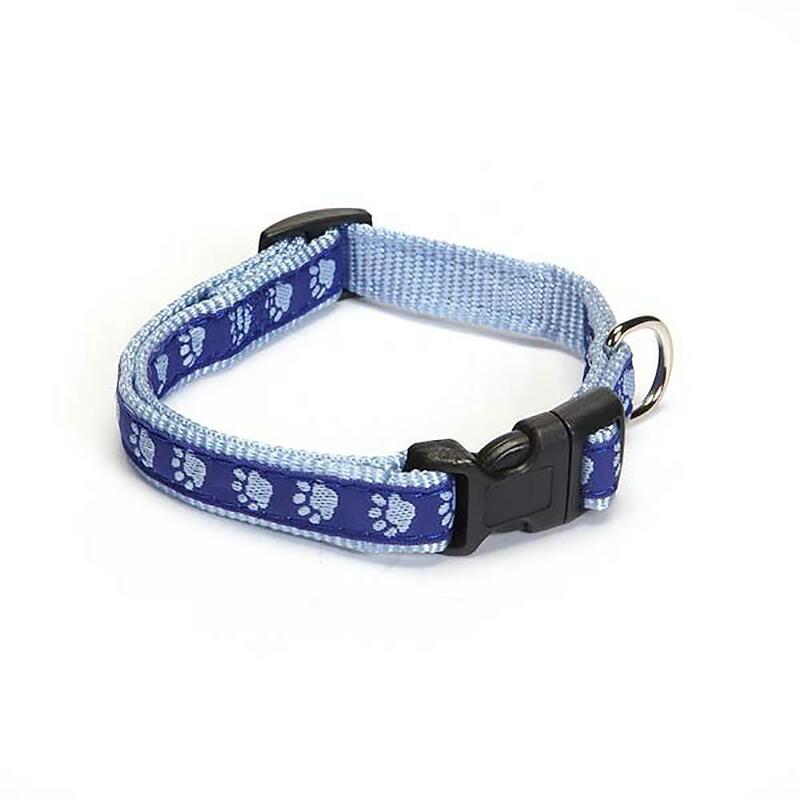 Give your pup a stylish look with our Guardian Gear Two Tone Pawprint Dog Collar in Blue. Our Guardian Gear® Two Tone Paw Print Collars give pets a classic look that’s paws-itively stylish. 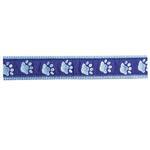 Ribbons with a popular paw print design are sewn onto durable nylon with reinforced stitching at stress points. Adjustable Collars have plastic, quick-release buckles for an easy, comfortable fit. Look for the matching dog leash, sold separately. 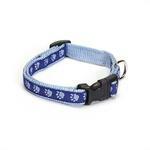 Guardian Gear Two Tone Pawprint Dog Collar - Blue Customer Photos - Send us your photo! Baxter is sporting his masculine blue collar while doing his favorite thing... Sleeping! Posted On 06/21/17 by Karen Rose from Valdosta, GA Yes, Karen Rose recommends this product! This Paw print collar and leash are perfect on my blue Merle Aussie puppy. It's well made, with sturdy hardware, and the quality I've come to expect from Baxter Boo. I even purchased another one in a large, so he'll have one when he outgrows the one he's wearing now! ?? This is a great-fitting and stylish collar. My pup loves it! Posted On 04/05/16 by Heather C from Fort Wayne, IN Yes, Heather C recommends this product! This collar is super cute, and my pug absolutely loves it! Posted On 10/05/15 by Todd D from Richmond, TX Yes, Todd D recommends this product! cute just what I was looking for for my small dog. Posted On 02/06/15 by Brenda L from Marble, NC Yes, Brenda L recommends this product! Very well made. When I wash Cody's collar, he cannot wait for me to put it back on. He hears his name tag jingling and he comes running. Posted On 01/01/15 by nicki c from Bloomfield, KY Yes, nicki c recommends this product! This site is so easy to use. I would def buy again from this company!